For years I’ve taught my students the same problem solving process. However, this year I spontaneously put a new twist on it, and it’s stuck better than ever before. As I was telling students they need to go through the steps to attack the problem, I added on that they attack the problem like a ninja. Eyes lit up. Smiles grew on faces. They all wanted to be a ninja. Kids always want to race through problems. I’ve found that they read the problem and immediately start underlining and circling. When they do this, they often target unnecessary information that thwarts their efforts. I teach my kids to read the problem through the entire way the first time before they start finding information so that they already have the question in their head as they are doing it. I’ve found that underlining and circling, as well as crossing out unnecessary information really helps students identify exactly what is being asked for them to find. Identifying what is known and what is unknown helps students find the relevant information and identify the irrelevant information. By identifying the known information, the students can figure out what operation is being used and can then write the equation. Students use strategies like drawing a picture, making a table, guessing and checking to solve problems. We discuss and practice these strategies throughout the year. Teaching students to check their work is crucial, especially because so many don’t do it, or don’t see the point in doing it. Have you ever told them to “Go back and check your work” and they just look at the page and say it’s been checked? It makes me crazy but so many students do just that. I teach my students to use the inverse operation to check their work to prove it’s correct. Just as in reading we use text evidence to prove our answers, in math we use the opposite operation to prove our answers. I’d love to tell you that every single student does it now, but of course that doesn’t happen. But, a girl can dream, right? We practice problem solving every day as a warm up to our math block. I’ve found students really need time to try out the strategies, opportunities to explain what they did, and time to work together to brainstorm and make mistakes. Students have 1 problem to do each day in their table groups and then we go over it. During this time we focus on strategies as well as correct answers I want students to continue to try new ones out and feel comfortable with them before high stakes testing. We use my 3rd Grade Daily Story Problems because they spiral through a variety of standards each month, are multi-step, and are rigorous. I’ve created a bundle for the entire school year. During the second semester I also send additional pages home for students to practice independently, and for parents to see the rigor that’s expected for applying the skills we’re learning. To check out the bundle, and download sample pages to try with your students, click the image below to head to my TpT store. To save paper (because giving students 25 pages each month) I print two per page and then double side them. To print two per page you just change the settings in the print dialogue box under page scaling. We also practice story problems based on specific, targeted skills like Area & Perimeter or Elapsed time. To practice those, we use my Story Problem Task Cards bundle. I generally print these out to use during small group instruction with me. You can check them out by clicking the image below. 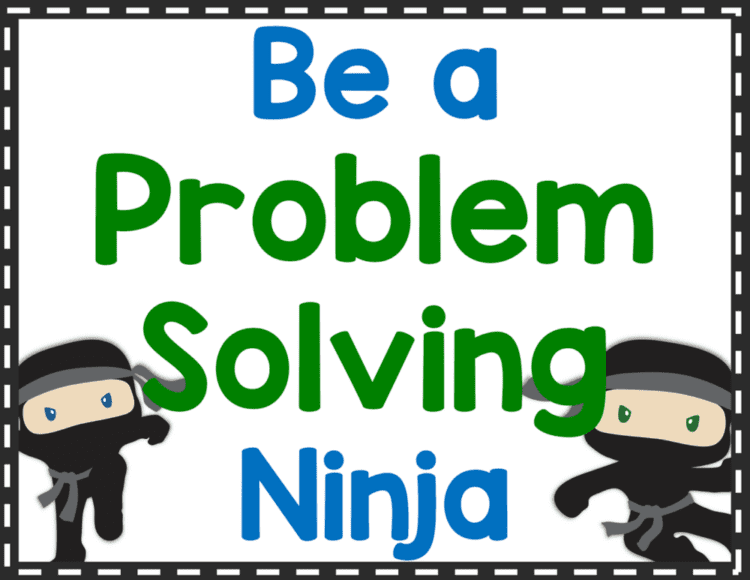 If you want to teach students how to be Problem Solving Ninjas, and use these posters with them, just click the image below to head to my TpT store and download them for free. Love this idea! Great way to organize problem solving!